This quilt pattern is called Shadow Star and is designed by Michelle Yeo who specializes in the design and creation of quilts that are inspired by quilts of the past. I attended classes with Michelle Yeo in order to make this quilt. It was made late in 2007. 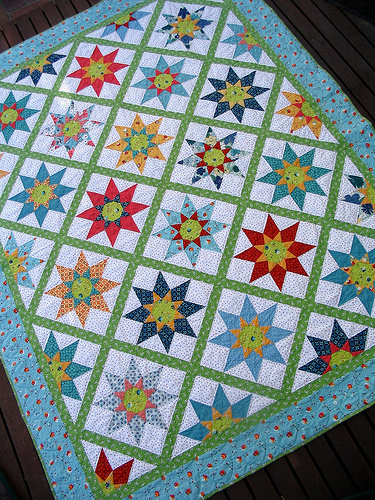 Michelle uses a lot of reproduction fabrics in her quilts, however, I really love bright, fresh and cheerful fabrics and used predominantly fabrics from the Denyse Schmidt's Flea Market Fancy collection. These fabrics are probably my all time favorite fabrics. Unfortunately my stash of these fabrics now is severely diminished! These are the templates used to cut fabric. Some of the seams are Y-seams, and setting in the octagon was no easy task, but perseverance paid off! I was really put off by the fact that octagon had to be sewn in last. This can be done by hand or machine, but I am no hand-sewer. So I was determined to do this on my sewing machine. The templates have small holes in them for marking the fabric, which is a great help for piecing together this block. 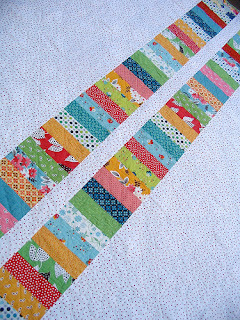 The back of the quilt is pieced also. The main fabric is a white background with a small red spot. I love the back of this quilt, the fact that it has so little detail, but is still so striking in appearance. Often the simple things in life are the best. The finished size of this quilt is 88 x 69 inches. 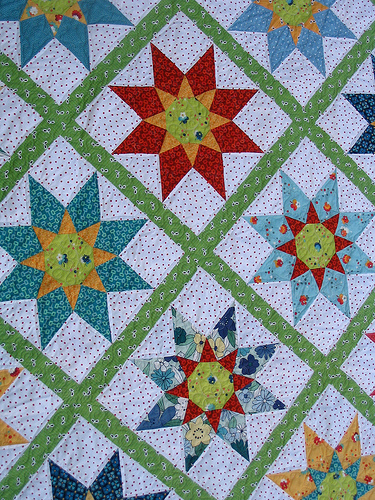 It was machine quilted by Karen Terrens from Quilts on Bastings. In case you are interested, the pattern and templates are still available directly from Michelle Yeo's website. 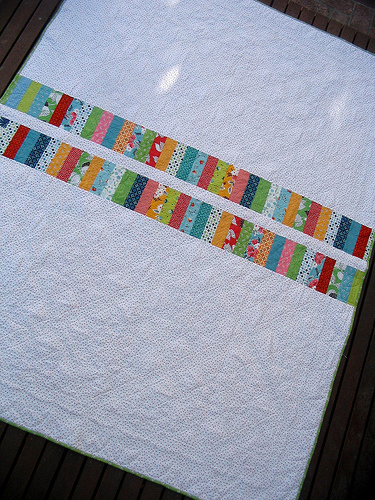 Here you can also view what this quilt looks like in reproduction fabrics. This is one fantastic quilt! I love your colors. Thanks for the link! Great quilt! Having never used templates, I can't even imagine how you start with this one, but I can see it must have been a challenge. What an achievement it must have been to see it finished! I have a little stash of Flea Market Fancy & haven't been brave enough to cut into them yet. Too precious! Oh, this is just stunning! While I like the original, I like it better in the bright colors. Your colors are just oustanding - and I love a pieced back. Thanks for sharing some of the details about your construction of it, sounds like a work of love. Beautiful quilt - your fabric choice is just perfect. That really is a stunning quilt! And so very impressive! i still have some Flea market Fancy in my stash, its Swell that I am out of and severally miss! Beautiful. I just love the back. It's pretty enough to be a quilt front! I'm with the others - your quilts are gorgeous - even on the back! They are a treat to look at. Beautiful! I admire you for sewing all those set in seams. So pretty!! I love your cheery fabrics and the pattern is great! THIS is one fabulous quilt!! I love it, thank-you for sharing your link on FMFF! I hope to do some little "features" in time, would it be ok to use this project at some point?